Red Lantana in a funnel planter. 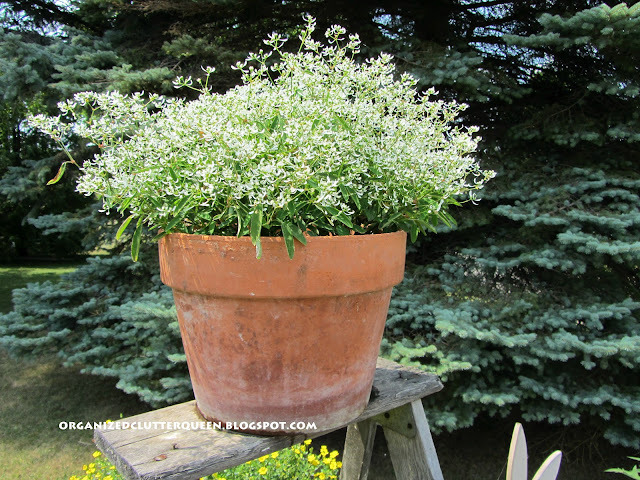 Diamond Frost in a terra cotta pot a top the step ladder. 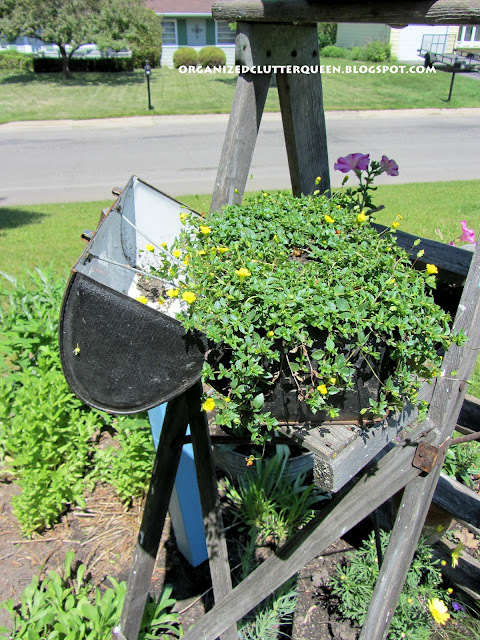 Step ladder plantings Super Bells and small funnel with hen and chicks. Hen blooming, also birdhouse moved over and daisy in its place. This vintage lunch box with Proven Winners Gold Dust. 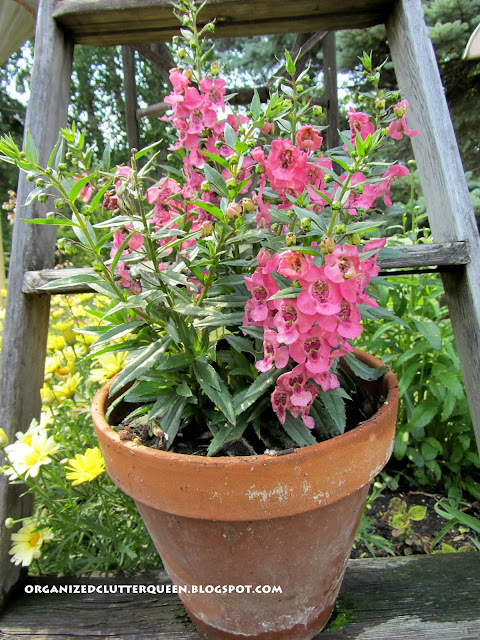 The step ladder bottom rung, pink Angelonia. That's what's happened to my Step Ladder in the Garden 2012. I have certainly had some gardening setbacks with cutworm caterpillars but these plantings were unscathed. Our grass is pretty brown in the photos from no rain though! I love the whimsical touches in your yard! I would have lantana, but my fool dogs eat it. That was fun to see the changes take place. Your plants look healthy and vibrant. Did you finally get rid the cutworms on the others? What worked? We got a sprinkling today...just enough to make it like a steam bath out there and not enough to make a real difference but hopefully lower the fire danger a bit. Stay cool! I love seeing the changes in your garden! Rain would sure be a blessing here right now! Thanks for sharing at the party this week! 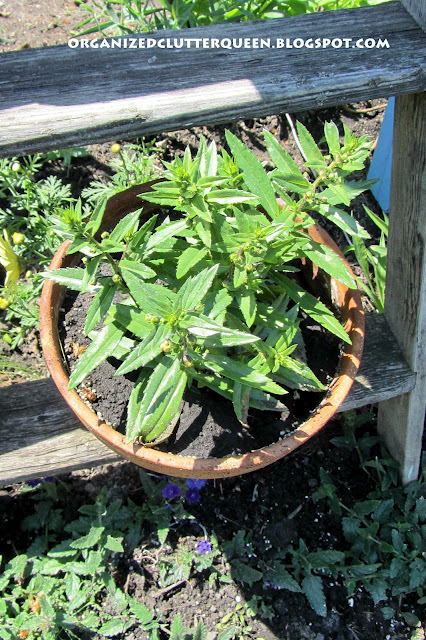 Your plants are just sprouting and filling the containers gorgeously. My water bill is going to be huge this summer, hot, and No rain. I'm been staying inside hate hot weather so. Thanks for letting me know you liked my two toned charmer buffet. So glad you think I picked the right one! Your plants are looking great. I love Diamond Frost euphorbia. I had it last year and it just kept on going. Beautiful. Don't know why I didn't get some this year. Duh! You definitely have a green thumb and a creative flair! My poor plants are just trying to survive the heat and drought. It's so good to see healthy ones! Beautiful! These plants look wonderful! What a creative way to display them! Especially love the lunchbox idea! What a great idea, so fun to see the pots progress through the summer! 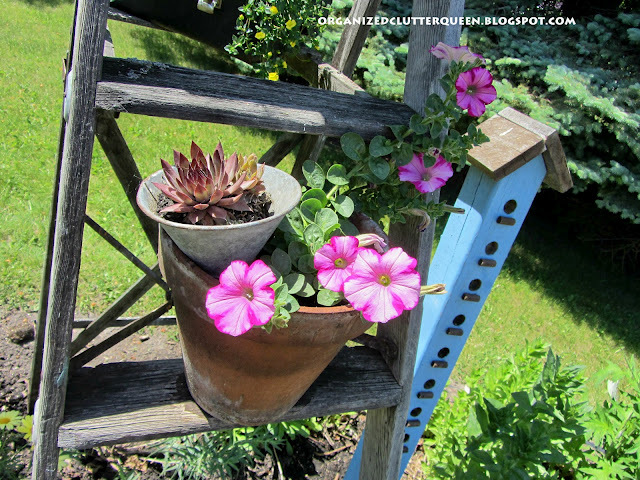 I love that pink petunia, it's a sure winner! 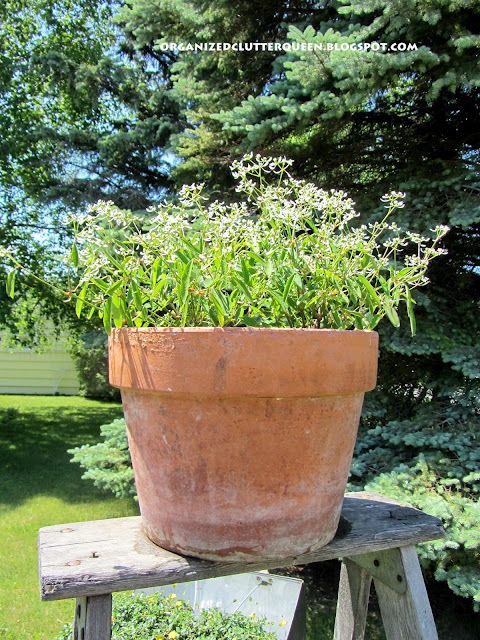 I just love before and afters of growing things. You certainly have a green thumb! Your plants look wonderful and healthy! I like your whimsical way for displaying them! Have a wonderful 4th of July! Hi Carlene, You have the best and most fun containers for your flowers. They look like they're thriving! What a great idea. Hope you don't mind if I copy you and show some plants we just put in and watch them grow. 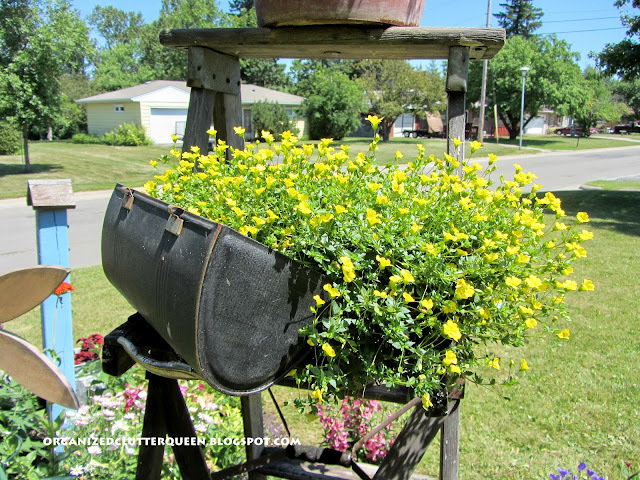 A lunch box planter...what a kewelopolis idea! Happy 4th of July. You have some creative flower containers:) Don't know the last pretty flowers! The grass is brown? Where?? These are gorgeous! Inspirational to keep my eyes peeled for such pretty containers myself ;) If you get a chance, stop by my blog and "Like" Hood Photography on Facebook! Thanks! I loved seeing the progression of your plants. You certainly have a knack for unusual settings and planters. I love it. Your plants look great! and I love all your wonderful planters! I'm visiting from the pinning game party, I'm pinning you, and I'm now a follower! Going through the entries at the "pin party", I remembered this post and "pinned" you! 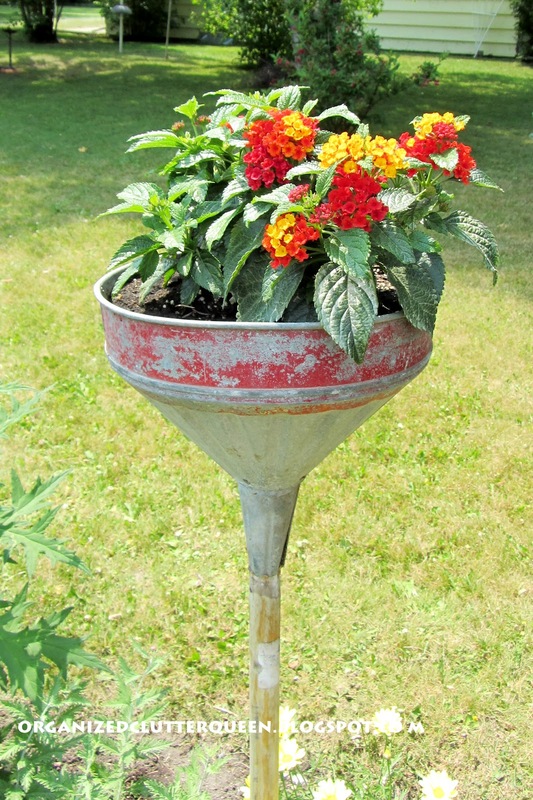 Fan of your recycled funnel ! What a great idea (discovered on Pinterest!). I want to do the same with succulents with the vintage funnel I found last week-end. 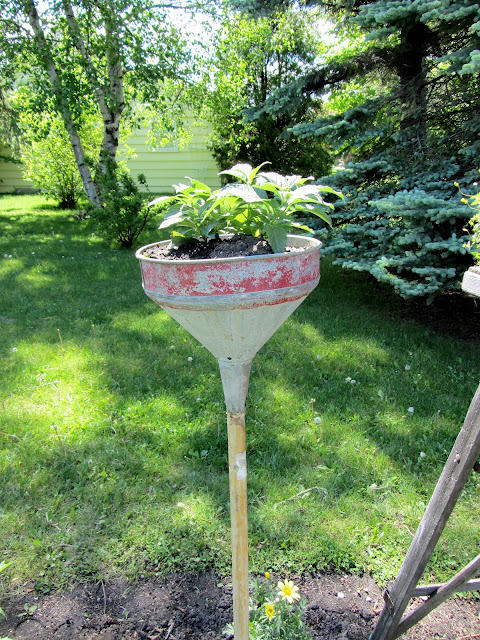 Do you mind if I show the picture of your funnel (with link of your blog of course) on my garden blog ? 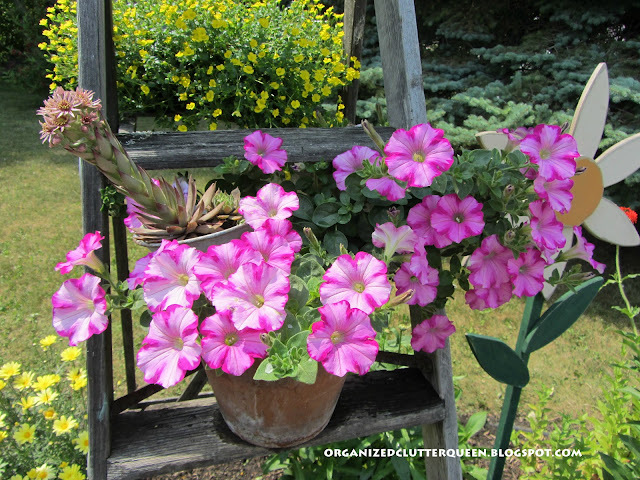 I love all the different containers you used in your garden! The funnels, lunch box...cute ideas! And fun to watch how they progress. Your flowers are beautiful. Great planters!